David FitzGerald hosted this event at Appledore Literary Festival. A highly successful evening with an incredible tale of the most talked about affair in history. 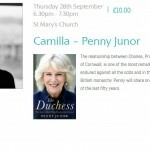 Penny Junor took us on a journey of intrigue and eye opening scandal with ‘The Duchess’.